Format (e- or p-): e-ARC. Why did I read this book: Because I ADORED Clare Vanderpool’s Moon Over Manifest which basically made me into a fan for life. It’s the end of World War II and 13-year-old Jack Baker’s father is finally coming back home. Unfortunately his return is marred by the death of the sudden wife he left behind and without knowing what to do with a son he barely knows, he sends Jack to a boarding school in Maine. There, Jack meets Early Aiden, a strange boy who often misses lessons and who can always be found listening to records in his basement room where he also spends time reading the number pi as a story and collecting news clippings about the sightings of a Great Appalachian Bear. The two strike an unexpected friendship and although Jack often finds himself befuddled by Early’s behaviour, he ends up joining the other boy on his quest for the Great Bear on the Appalachian Trail. 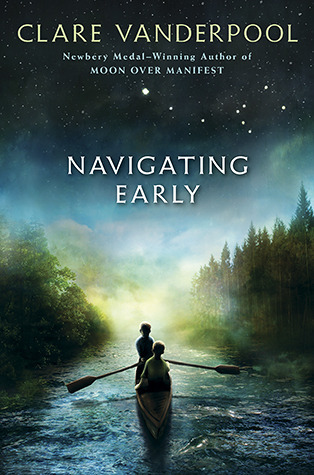 Navigating Early is the sophomore novel from Clare Vanderpool, following up the success of her first award-winning novel Moon Over Manifest. Like Moon it is also a historical novel, featuring a young protagonist and it is a very similar story thematically speaking but it diverges from its predecessor perhaps in an essential way. The similarities appear in the way that this too is a novel about connections, coincidences, memories and one that rely on stories within stories to carry some of its themes forward. The main recurring story-within-within story is that of the number pi as told by Early, who sees the infinite (or is it?) number as the story of a questing character trying to earn his name. It is never stated outright in the novel because at the time the novel is set the identification didn’t exist but Early has Asperger’s Syndrome (a high functioning form of autism) and is a savant that sees numbers and therefore to him “pi” is not a what but a who. As the boys navigate around the trail, and Early tells his tale, the two narratives start to blur. En route, they also meet memorable figures and learn more about life on the trail and those figures’ stories end up being threaded into the narrative in a slightly too coincidental way. That said, if the author does one thing really, really well is to take this reliance on the coincidental and turn it into something wholly moving and welcomed. My thoughts so far haven’t quite captured the beauty of the story but this exists in the way that Jack slowly understands Early or how Early’s extraordinary gifts are more important to the quest than we could ever have imagined. The aftermath of World War II is also of heartfelt importance here in how it has affected the lives of those who survive leading Jack to have more insight and understanding of his father’s behaviour as it has been shaped by his experience in the War. The ending, when all stories come together, is extremely touching. That said, one of my favourite things about Moon Over Manifest was how diverse it was in the stories it told and this is something I sorely missed in Navigating Early. Although I truly appreciated the stories being told here – of soldiers coming back home and of boys growing up – and think they are important, I also felt slightly sad that for example, all the women depicted are those left behind or those who passed away, rarely active in the story at all, functioning more as motivation than being characters on their own. Despite these reservations, I found Navigating Early to be a quiet, hopeful, beautifully rendered story. Yes, I think the only (live) woman in this book at all was the librarian? I also missed the humor of Moon Over Manifest…when listening to that one on audio, I constantly found myself with a stupid grin on my face at the town’s antics and scheming. The ending of Navigating Early was just as touching to me (if not moreso even), but it wasn’t as epic. I did really enjoy this one as a story of friendship and hope, though I wish that it had been more different than her debut formula-wise. Doesn’t sound like one I want to read, but I do love the cover. I just finished Navigating Early (really, it’s been about 15 minutes) and had to pop back to say how much I LOVED this book. I give it a Smuggler’s 9 leaning toward 10. I also loved Moon Over Manifest and, like Ana, loved the diversity of stories in it. However, (i) you don’t want her to write a similar story or repeat herself; and (ii) Navigating Early is not the story of a town. It’s the story of Jack and Early’s journey and could only be told through Jack. Trying to find the voice for Early would have been too difficult and probably would have rung false. I think that Vanderpool chose correctly not to do it. I knew that Early Auden could not hold back the ocean. But that strangest of boys saved me from being swept away. Clare Vanderpool’s writing has grown so much between these two books. I chose the above quote because it says so much about Jack and Early and also because water plays such a huge role in the book. With characters becoming unmoored and drifting until they find their anchor. I don’t know how she did it but her writing evokes that feeling of floating, being unbound caused by emotional distance from grief and loneliness. As you were reading it, you felt like you were drifting in the waves. Not because you didn’t know where the story was going or the author was floundering in her storytelling (so NOT the case). It was through the rhythm of the words that you felt that ebb and flow. It’s so subtle that you don’t notice until you’re about half way through the book. Loved it. Yes, the Bechdel score on this is 1:3 but I really don’t mind it here. This is Jack and Early’s story and they are living in an almost entirely male world. After all, it is set in an all male boarding school. It’s the story of men’s relationships with each other – as friends, brothers, teacher-student, and father-son. Any attempt to introduce a female character in either a supporting role or main role would have been awkward and contrived. How would you imagine it could be done? The spunky daughter of the headmaster who tags along or some other trope? Sometimes, you just need a story without females being a major character(s) just like you need a story without males being a major character(s). I did not find women diminished in this book. Clearly the loss of the mother is felt throughout the book and the other women (Miss B and Mrs. Johannsen) do have roles to play. Jack at one point says that he misses the sound/voices of women. Maybe that’s why he loves the Billie Holiday records so much? Her songs bring that needed female sound to him as well as reflecting his pain, heartbreak, and loneliness (plus the fact that Billie Holliday is just plain AWESOME). A beautiful story of friendship, compassion, belief, and grief but with a sense of hope.